Typical Monday night Gerard food. And when I say Gerard I mean Creighton, Trevor, Brendan, me, Malachi, Red, Asher, Mom and Dad. The other Gerards out there in Ohio? Yeah, I have no idea what their typical is. This meal is our staple meal. The veggies have only been added recently and same goes for the avocado. If it were not for me cooking, my family would eat this every single night of the week. Except their meal really would only be grilled chicken and rice. You guys, they are so boring. My mom has gotten a ton better and has strayed from her beloved noodles with butter, but my brothers? Sometimes though they are right. Only sometimes, most the time it’s my way or they are all getting fish for dinner. And if you have been reading for any amount of time you know that only my dad and I do fish, the rest of them want to barf if they come within fifteen feet of the said fish. I shoved a lobster tail with the shell still on it in my seventeen, going to be eighteen in November, younger brother Kai’s face and he freaked. Honestly, you should have seen his face. Oh and I don’t normally go around shoving lobster tails in people’s face. This was just on odd day. For some reason I just couldn’t resist. I think my brain was going stir crazy from only seeing the inside of our dark, dark kitchen in our little condo we rented in Hood. I spent way too many hours staring at the wall while chopping, mixing, and whatever else it is I do. The place needs a skylight. Reason number eighty-eighty why I am so happy to be home. Windows. The chicken is tossed in a super simple seasoning with tons of parsley, basil, olive oil and lemon juice. Then I skewered the chicken and placed them on the grill. 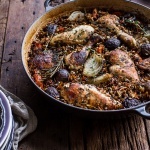 This is my favorite method of cooking chicken, but of course the chicken can also be seared on the stove or roasted in the oven. 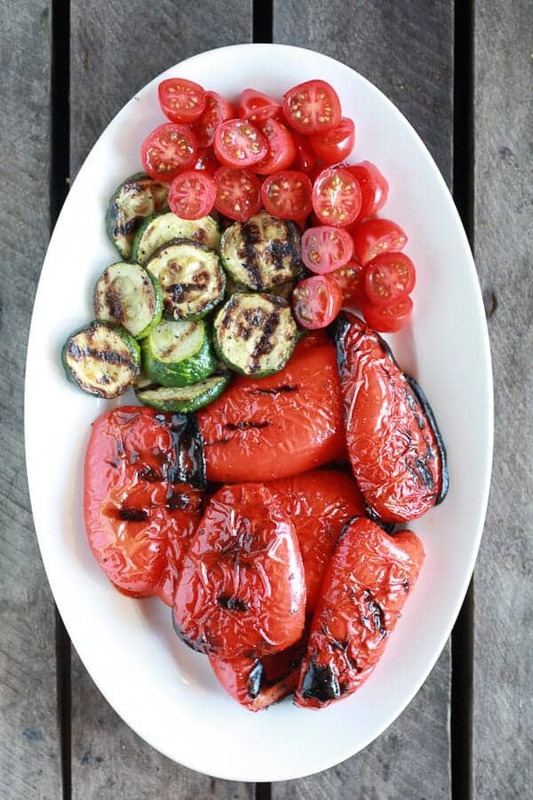 Same goes for the veggies, but again I love the flavor the grill adds to the zucchini and red peppers. Plus, it’s August and that means it is probably really hot wherever you are. The grill keeps things cool and easy. I pretty much always only ever cook white rice. Never brown and not because I don’t like it, I do. It’s is because for the life of me I cannot not ever properly cook brown rice. It always, always no matter how long I cook the rice stays somewhat hard. Never soft like my trusty basmati or jasmine white rice that I can cook with my eyes shut if needed too. But if you guys prefer brown, that works too. 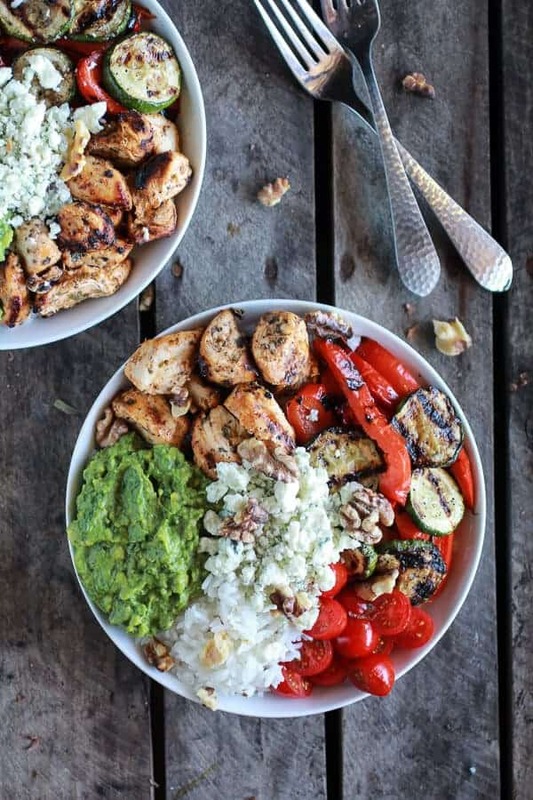 Love how you added grilled veggies to this “bowl” – they make the chicken and rice look so YUM! This will go perfectly with my ‘healthier’ planned week of eating. I can just substitute brown rice. Looks delicious Tieghan! Thanks Melanie! Hope you love this! Awe, thank you so much! You are so kind to share my site with your co-workers! Hope everyone is loving it! I feel like I can taste how fresh and flavorful it is already! Gorgeous, Tieghan! I just made rice bowls a few nights ago and my family absolutely loved them. They are the perfect quick and healthy meal. Thanks Dara! My family loves rice bowls! 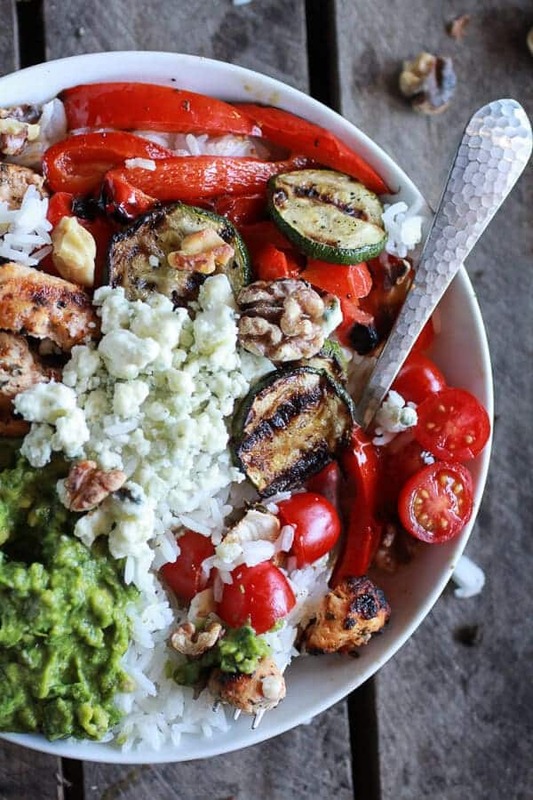 I love rice bowls for dinner, so versatile and so filling. YUM!! Thank you!! Hope you give this a try and love it! You must get a rice cooker! It cooks white rice AND brown rice perfectly and can even make oatmeal in the morning! They even have timers so it can be ready whenever you are! I use a Zojirushi. Worth the investment! I have heard those rice cookers work wonders! Thanks for the suggestion! I have a zojirushi fuzzy logic rice cooker as well. It makes great brown rice but it can take almost two hours. And it makes the BEST white rice. Really it will change your life. 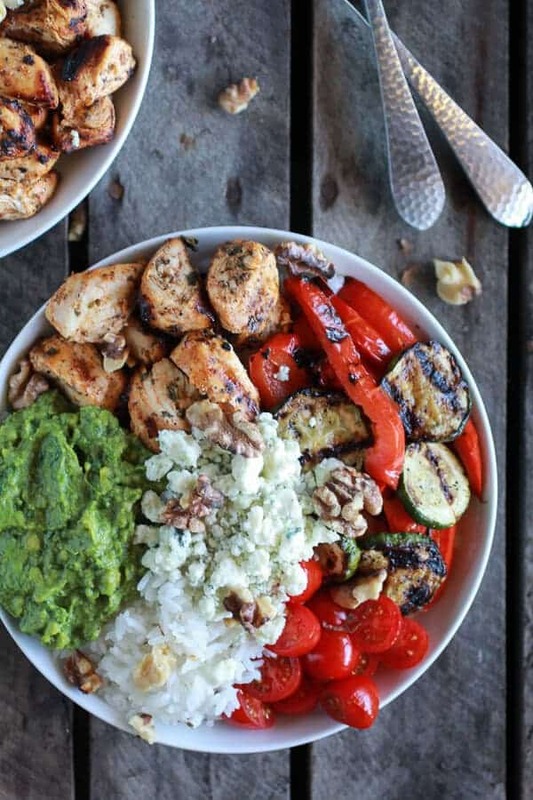 What a beautiful bowl of colors and freshness! My family is like that too! I grew up eating buttered noodles and chicken and rice. They have since grown much more adventurous and add a lot more veggies in, but those are still staples that I see when I go home. The recipe looks so easy and delicious. What a good summer meal! I love the sound of this healthy week night meal! You should trying baking brown rice. It’s so easy and come out perfectly every time. That is an awesome tip! Thank you, I cannot wait to try that! If this is your typical dinner, I am totally moving in. Also, I use instant brown rice: CONFESSION!!! Greatest confession ever. Seriously. Going to go buy some instant brown nice now. This is a great weeknight meal. I’ll have to try this. Thanks! Ben is such a creature of habit, he hates when I break with our dinner routine. 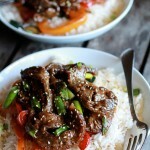 He would love all the veggies in this – and I would love that chicken and rice. Girl you have my dinner planned out! I am such a creature of habit. The only thing stopping me from making the same stuff everyday is this blog. LOL!! I cook my brown rice in the microwave for 25 mins. It cooks perfectly. Brown rice is meant to be chewy so I dont expect white rice texture -but 25 mins definitely makes it softer. Whoa! The microwave? What a great tip! Thank you, I cannot wait to try it out! Looks good! As for brown rice, my parents always used to soak the rice for at least half an hour before cooking, to help soften it – it seemed to work well for them. Thanks for tip!! I cannot wait to try that!! I love meals like this – totally customizable and I love being able to throw whatever leftovers I have on top! This is also a staple meal in our house! I love meals like this too! Thanks Maria! You have no idea how much I love, love this idea. 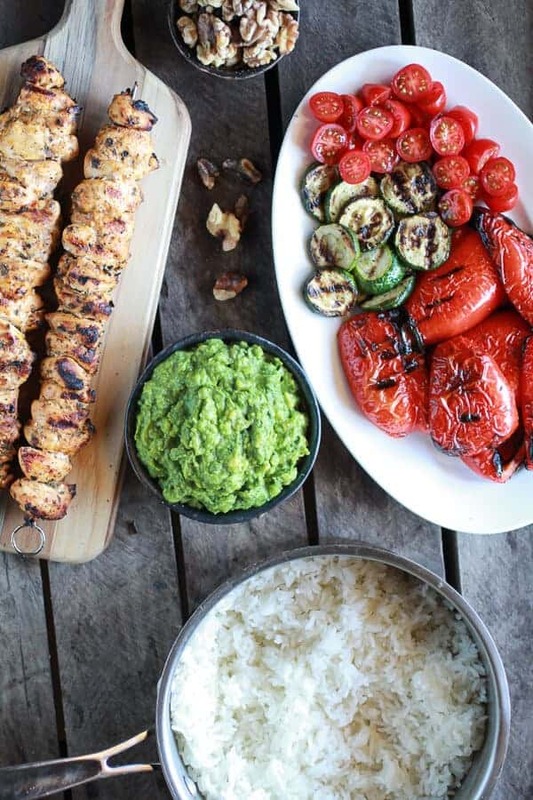 It’s truly a perfect summer dinner. I love the look of these bowls!!! 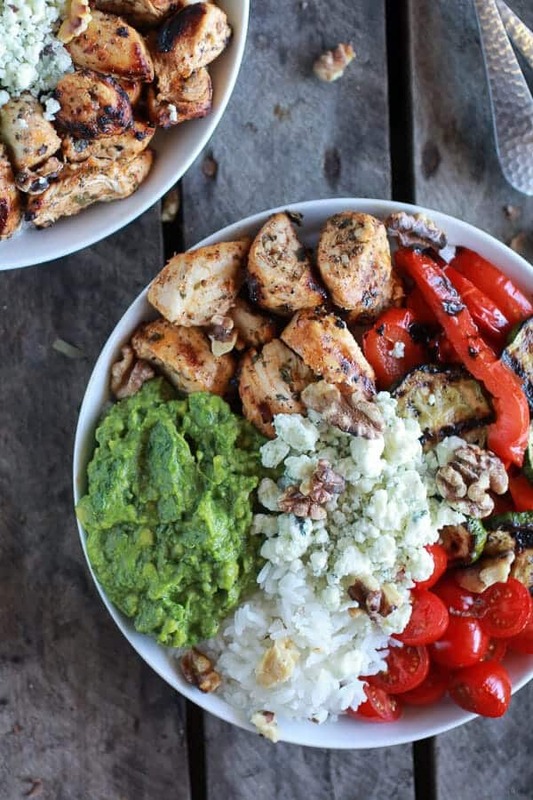 This is a great idea for chicken and veggies – love the added avocado – of course!!! Mmm! Thanks Robyn! Avocado makes everything better! You capture such amazing color in your photos. I feel like I’m right there at the table, which isn’t fair because I’m so hungry right now!! Awe, thank you so much!! Wish I could send you a bowl! This looks RIGHT up my alley! Love all of those roasted veggies and loads of blue cheese!! The blue cheese rules! Thanks Ali! Whoa! I need to up my chicken and rice game. Dang girl!! I make this exact same meal all the time!! Its so good! I know, it really is! Thanks Shanna! I could easily eat these every night for dinner! 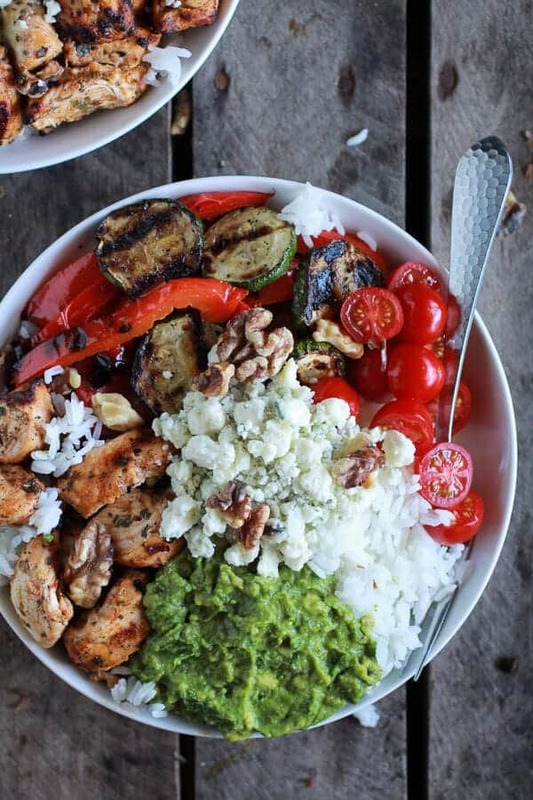 Love all the colorful veggies you added! Sounds like you have a ton of fun with your family in the kitchen! 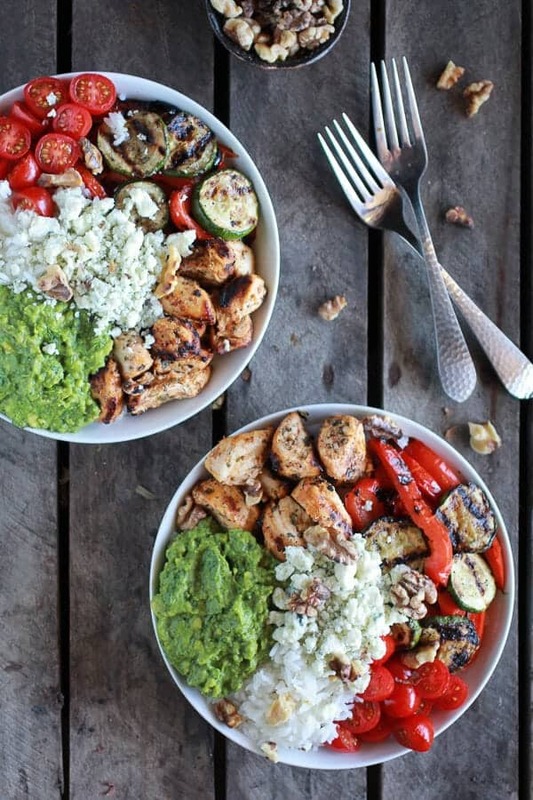 Love these rice bowls, need to eat this soon!! This looks amazing! I need to try this. I would eat this everyday. For the rest of my life. LOL! We will!! Thanks Monique! OMG this looks good!!! Found you over at Tuesday Talent Show. I am co-hosting Tasty Tuesdays this week and would love for you to link up this recipe. I made this for dinner and it was AMAZEBALLS! thank u so much for posting this delicious treat! You are so very welcome!! Thanks for making this and I so happy you loved it!! This looks amazing! Have you tried baking your brown rice? I first saw the idea in a cooks illustrated magazine. It comes out perfect every time, I make huge batches and freeze. I have never tried baking my rice. That is genius!!! I just tried this tonight! It was delicious! Thanks for sharing. Oh yes! Your are so welcome! I am so happy you loved this! Hehe!! I know, it’s pretty awesome! Thanks Lisa! Perfect dinner indeed. I so know I’m going to try this out as soon as I can get to grilling. Looks absolutely delicious. What a fabulous meal, your family is so fortunate to have you in the kitchen! Thanks for linking up with What’s Cookin’ Wednesday! I am so thrilled you loved this!! Thanks for making it and you are so very welcome! WOWOW this is so my kind of dinner!! Im already rackin my brain to see if I have all the things I need to make this tonight..sooo yum! Let me know if you make it!! And if you do I really hope you love it! Thanks so much, Alaina! You are the best! I saw this and just had to make it! Instead of rice, I used arugula because I had some leftover and wanted to use it before it went bad. It was phenomonal! I had leftovers the next day on rice and it was also delicious! Oh yea! I am so happy you loved this!! Thanks so much, Katie! Thank you, Stacy! I will have to give that a try! You have so much goodness in this bowl!! I can feel the pounds coming off by just looking at your photos!! Hehe! Haha! Thanks! It is one healthy bowl! Your are so welcome!! I am thrilled you loved it! Just wanted to let you know I am in the middle of making this for dinner. It’s all I’ve thought about all week since I discovered your blog! I can’t wait to let you know how it turns out. Thanks for sharing your gifts! re: the Chilaquiles, the second reader is correct. It is in deed prounounced “Chee-lah-kee-les! Oh thank you so much! I cannot wait to hear what you think! You are so sweet and your kind words mean so much. You have no idea! You are a genius!! It tasted exactly like I knew it would when I first laid eyes on the gorgeous photo! So much like Summer, a bit like Fall, fresh, healthy, perfectly spiced..the marriage of every spice along with all of the different textures was incredible! My husband and I enjoyed every bite and I want to invite everyone I know over for dinner so I can impress with this fresh dish! Cannot wait to make the next recipe I have saved. Thank you again and keep it up! Hah! Denise you comment made me smile! First of all, I am so happy you guys loved this!! It is one of the cozy meals that is still light and fresh. So good!! Second, you are too funny! I love reading everyones comments and then being able to interact with them, but it does take time. So worth though! Thanks Again! I made this last night and what a treat! Avocado is always readily available in the kitchen, but I’ve never thought to add walnuts and blue cheese. Extremely yummy! I do love spicy so I added some chili peppers to the guacamole. It paired very well with the blue cheese crumble and crunchy toasted walnuts. Thank you, thank you for this wonderful recipe! So happy you love this!! Thanks so much, Kat! How do I get on your emails of your website? Hi Donna! You have to sign up on the right hand side of my sight where is says subscribe by email. Let me know if you have any problems or questions and thank you so much for signing up! Thank you SOOOOO much for this recipe. Sunday night dinner – SORTED! Excellent post. Inspiring, super yum food. LOVE the writing. Great blog. I visit lots and always want to eat here. Thank you for your wonderful work. Try Alton Brown’s Baked Brown Rice reipe. It is absolutely foolproof! Just make sure to use short or medium grain brown rice. Thanks for the tip! I will!! This looks wonderful! Can’t wait to try it when it starts to get warm again. Also, your photos are beautiful, great work! This dish is so unbelievably delicious!!! My husband and I probably eat this once a week. 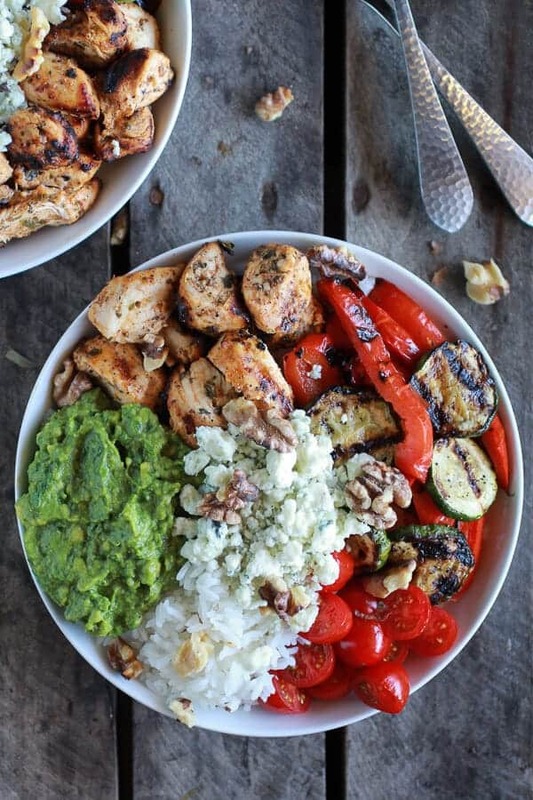 I LOVE the combo of the grilled veggies, blue cheese and toasted walnuts. We use brown rice instead of jasmine, though. I’m so glad I found this recipe!!!! SO happy you love this dinner! Thanks! Just wanted to let you know it looks like some of your content was stolen and used on another site without credit. 🙁 I noticed this recipe off hand, not sure if there are more on their site of yours or not. Looks like the entire website is stolen content. Thanks so much for letting me know, I will look into it! Thank you so much for posting this recipe! I made it tonight for dinner and it was amazing 🙂 I especially love the chicken and roasted peppers, tastes great but healthy, love it!! I made this tonight! So fabulous! 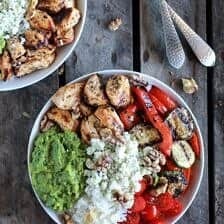 I adore the blue cheese with the avocado, and the freshness and brightness of the tomatoes pair so well with the savory chicken, sweet peppers, and earthy zucchini! Thank you so much! So glad you loved this! I made this a few days ago and it was absolutely WONDERFUL! Thank you for sharing this recipe. Can you cut the crap and just give us the recipe? I don’t need to look at 10 of the same goddamn picture either. Hey, than just don’t read. Thanks so much for clicking over!!! When I saw this recipe I could tell just looking at it I was going to love it. I just made it and it is awesome! I did cheat and used rotisserie chicken, I also cooked my zucchini on the cooktop. I used feta instead of blue cheese. I loved that every bite had something different. I will make this one a lot!!!! SO EXCITED you love this recipe! THANKS!! I just found your blog and I love it. You’ve probably already figured out how to cook good brown rice, but if not try looking up Alton Brown’s baked brown rice recipe. It turns out perfect every. single. time. No joke. I do use a little less salt as I find his recipe makes it a little too salty. Unfortunately, we’ve given up eating brown rice as I found out that most brown rice has high traces of inorganic arsenic. i am so excited to make this! it looks so delicious! thanks for the recipe! did you feel like it was dry and needed a dressing of any sort? I was curious what would pair well with it? Hey!! I think that whatever you favorite dressing is would be great. Maybe balsamic? The photo alone drew me in and I knew I have to make this! And I did! Not to sound dirty, but I love how it all comes together in the month. Great instructions, simple ingredients and I need to make more! AMAZING RECIPE Gurlfriend! Too much story. Scrolling to the end to get to the recipe. Whatever happened to a recipe and instructions and maybe a picture? YEAH! So happy you love them! THANKS! Teighan, I just wanted you to know that I’ve been making this dish now regularly for about a year, and it’s one of my healthy go-tos! Just discovering the rest of your blog, and your photos are gorgeous. Just sending some admiration from one blogger to another! This recipe is STELLAR. So good and so fresh. No, Thank you!! Happy you like it! Thanks for sharing this! I am pretty sure my clan would go bananas for this. Gonna bust out the grill ASAP. Thanks so much! Hope you love the recipe! I made this rice bowl yesterday exactly as described here and it was AWESOME! 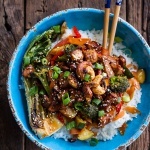 This was a yummy combination of flavors..I used jasmine rice and came out well using the method described in the instructions – I’ve tried other rice bowl recipes and didn’t like them– thanks for posting this, I’m a believer again! 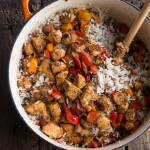 I have tried this recipe twice now and my husband and I both love it. We love it enough for me to post this comment! So good! YAY! So happy you guys love it Cheryl!! Thank you!! Hi Teighan, Just discovered this recipe through the HuffPost Taste section and made it for supper tonight. Delicious! We loved the combination of flavours. I replaced the blue cheese with feta cuz blue cheese scares me 🙂 I’m looking forward to trying more of your tasty-looking recipes. Thanks! Made this for dinner except I used riced cauliflower instead of actual rice. It was pretty good. I left out the walnuts. My kids had sushi rice in their bowls, but they didn’t think blue cheese and rice were a good combo. Definitely several ingredients I had not previously tried together. Well for the most part I am glad you enjoyed these, Rebecca! Thanks! I have to try this recipe soon too! Haha chicken and steamed white rice are a staple at my house. I would cook fish every day if I can have it my way too. 😉 These days, I only cook fish when it’s on sale, so that my husband won’t get too grumpy since he eats whatever I cook even though he isn’t the biggest fan of fish. I hope you love this recipe Eileen! I am totally with you on that one.. I love fish! Thanks so much! I wouldn’t recommend the basmati. The rice was overcooked. Basmati only needs 10-15 minutes maximum. I would use brown long grain rice next time too. Other than this and the amount of oil, would do again. HI Charlotte, sorry for the trouble. I have never had Basmati rice cook that fast. It always takes me 25-30 minutes. Thanks for trying this recipe! Here’s what I did: cut up two red peppers, two zucchinis, and 2 chicken breasts. Toss them in a bowl with 2x everything listed under “chicken”. Dump it all on a cookie sheet and bake in the oven at 425 for 25mins. 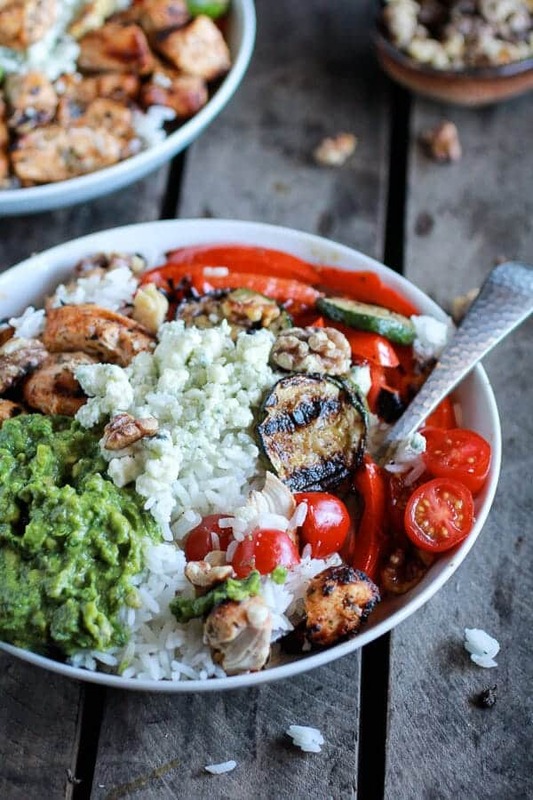 Served with diced avocado and feta cheese over rice. BOOM AMAZING! Way easier and less clean up. I also put some sauce on there: 1:1 Greek yogurt:mayonnaise (.5c each) with 6 garlic gloves some salt and as much or as little siracha as you can handle. SERIOUSLY. I would eat this all day every day! Thanks for the inspiration! Sounds amazing Jennifer, so glad you enjoyed this! Thank you!